Analyze keyword progress with Monthly Snapshot Graph that displays the rank or average rank for selected keywords by month, over a specific period of time. Select up to 8 keywords to compare in this report. Select the date range (Month and Year) for the data in the report. Choose the Snapshot Day, this will determine the date the rank will be displayed for. You can select a specific day of the month or the Average rank for each month. Add a custom report title (optional). Select the keywords you want displayed in the graph. This graph will display a maximum of 8 keywords at a time. Select the tag(s) you want to filter the graph results by, if desired. Select the domain you want the report generated for. Select the search engines you want included in the graph results. Use the up and down arrows to reorder the display order of search engines in your report, if desired. Please refer to the Report Toolbar and Track tab sections of Navigating Rank Ranger for additional information regarding report views, data export, adding this report to an existing White Label PDF report and more. Drag the new report or graph into the position you want it to display in the PDF and confirm that the Date settings do not conflict with the automated scheduling settings. PDF Report Content screen, then click the Add Report button and select the Campaign name and Report: Monthly Snapshot Graph. Saturday of this week (because weeks begin on Sunday and if reports are sent on Monday, then Saturday of this week hasn't yet occurred). Custom Report Title (optional): Displays across the top of the report section. 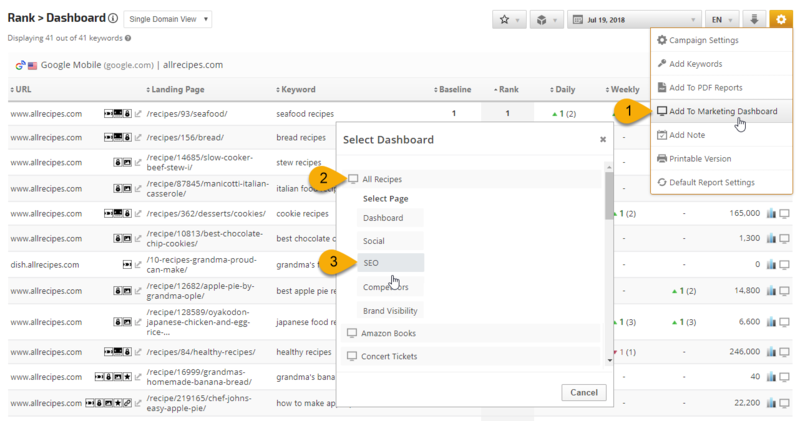 Select up to 8 Keywords by adding or removing the check mark next to the Keyword. Select a specific Domain by choosing the domain from the dropdown menu. Select the Search Engines to display in the report. If multiple Search Engines are selected, you have the option to change the display order by clicking the arrow next to the Search Engine and dragging it into the desired order. Refer to the Report Options section for details regarding the display settings, filters and sort options available for this report. To change the number of weeks or months displayed in a specific report, click the gear icon for any marketing dashboard report element and expand the Date option section, enter the number and click the Save Button. Client Dashboards display our default report options for each individual report and graph until you modify them. To customize the display of the report, expand the Report Options section, change the settings and click the Apply Changes button. Then expand Report Options again and hover over the Save icon and select Save as Default for Client Dashboard. After saving the Client Dashboard default, any changes that you make to the report options will not affect the display in the Client Dashboard unless you overwrite it by following these instructions again. Open the Campaign Settings > Client Dashboard screen and check the box corresponding to the report(s) you want displayed in the dashboard, and then click the Save button. 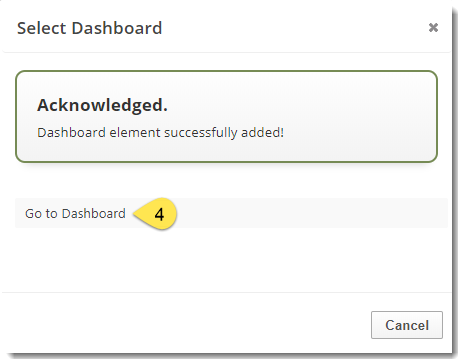 Refer to Client Dashboard Settings documentation for additional instructions for customizing your dashboard.